One of the primary functions of your brain is to make sense of the world around you. Think of your mind as an extremely powerful information processor that is constantly absorbing data (reality), then interpreting it through various lenses (making meaning of reality). Put simply, we are meaning making machines. It’s important to note that the meaning we attach to certain events is often habitual in nature and therefore out of our awareness. 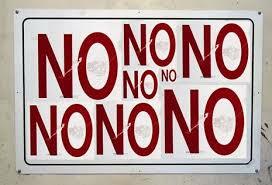 The title of this blog poses a very important question – What does “No” really mean? Well, based on what I just described to you, the answer can be different for everyone. After all, the word “No” is just that; a word. Nothing more, nothing less. What gives life to this word, or any other word for that matter, is the meaning we attach to it. Let’s take a look at two different examples of interpreting the word “No”. The first example happens to come from my beautiful six year-old daughter, Emerson. Perhaps one of her greatest gifts is her persistent nature. She maintains an incredible focus with regard to the things in life that she truly wants. Whether it’s a trip to Oregon to visit family or an afternoon snack, she always remains steadfast in her approach. However, sometimes what she wants isn’t in accordance with what Mommy and Daddy want. This is where the word “No” enters the picture. The other day she asked me if we could stop at Sprouts on the way home to get a water bottle that she had seen during a previous visit. Given the hectic schedule of our day, I quickly responded, “No.” Surprisingly, she remained quiet. Thinking that she would eventually lose interest, I decided to let it go. However, over the course of the next several days, she asked me for that water bottle six or seven more times. While she obviously wouldn’t be able to articulate the meaning she attached to the word “No”, I like to think that she interpreted it as Next Opportunity. In other words, she was curious about my answer and used it as an opportunity to scheme other approaches. Now let’s look at my personal example. A few weeks ago I was set to begin a series of leadership coaching sessions when I received an email from the parents essentially saying, “No, we’re not interested.” Rather than choosing the curious/creative lens that Emerson had used, I noticed my thoughts spiraling into negativity; my powerless lens was in full force. Did I say something wrong? Did they see something on my website that shouldn’t be there? Am I good enough to do this? The only thing that happened was that I received an email that contained the word “No” (reality) and I began to make it mean something about me (interpretation). I didn’t see it as Next Opportunity, I saw it as No Opportunity. Rather than thinking about the thousands of other families in Arizona who would potentially be interested in my coaching, I chose to focus all of my mental energy on the one person who had said “No.” Thankfully, after a few hours of hanging out at my own pity party, I was aware of my powerless lens and chose to be curious about the email. As soon as I did this, my energy changed and I felt more empowered.